I spent much of the day catching up on my CPA review assignments - I was three days late, but now I'm current, barely. I haven't made the rounds to the Round Robin entries yet, but hope to get to that tomorrow. This evening after finishing all those units on the Securities Act of 1934, I edited 39 photos for tonight's blog entry. But actually writing the entry...that's a problem. Rather than just tell you where I took these photos, I want to give you the whole virtual tour, but frankly it's late and I'm sleepy. So. I this entry I will merely post five of the photos, without even a link to Picasa. Later I'll tell you all about them. In the meantime, can you guess where I was when these were taken? Yup! It's time for another Round Robin Photo Challenge. This one, "Growing," comes to us from Jan, AKA Whammy, of the blog The Ellis Family Cincinnati. I have no baby birds or kittens to show you, my dogs came to me fully grown, and obviously I have no kids. What growth can I chronicle, then? The obvious answer is plant life. But before we go there, let's check out a different kind of growing. 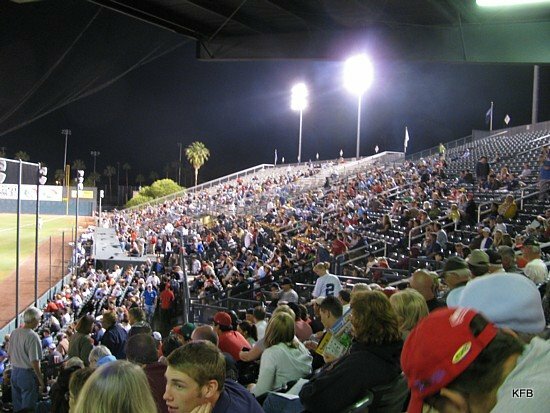 Here's part of the crowd at the first game of the reconstituted Tucson Toros baseball team, just before game time. Pretty sparse, right? When I looked out on the same stands later, it was obvious the crowd had been growing. John pointed out that at any given time, a lot of the people in attendance were wandering the concourse, or in line for beer or hot dogs or whatever. This was especially true before the first pitch! 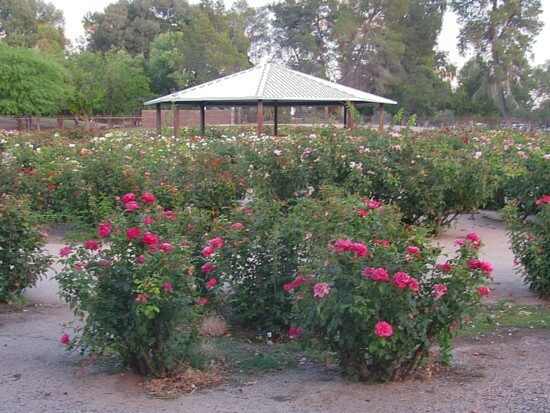 Here is the rose garden at Reid Park as I first saw it on February 28th. The plants were all cut back for winter. 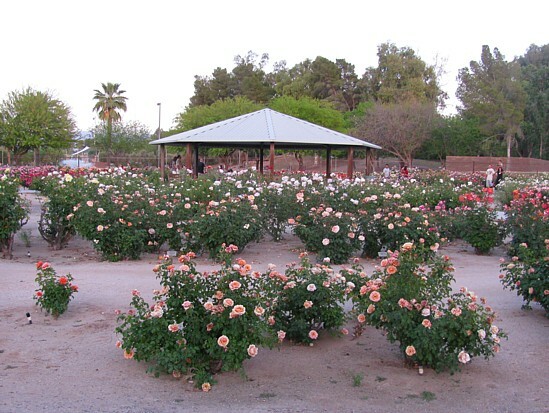 The only roses in evidence were a very few found on two rosebushes that were growing through the garden fence. By April 26th the roses were definitely growing, and definitely in bloom. May 29th, and it's safe to say they're still growing. 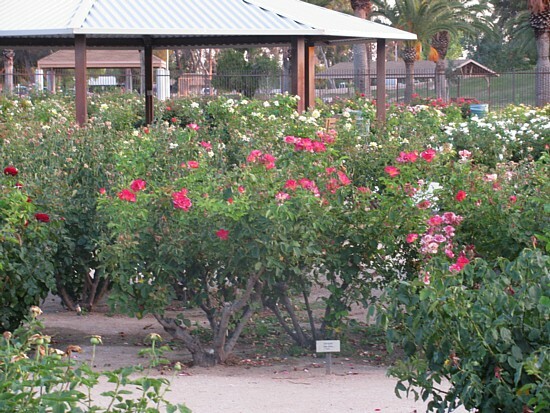 Is it just me, or have those rosebushes grown unusually tall? I have other plants I could show you in time lapse, plus freshly green grass in the park and embarrassingly long grass at home, both growing in response to last week's rain. But for once I'm going to show some restraint, and end this entry after "only" five...er, six photos. Now let's go see what's growing before the cameras of the other Robins! Why? Why Have You Heard? Butch and Angie - Posted! Fhaye ***Welcome, new member! *** - Posted! Weekend Assignment #269: Are you a sports fan? If so, what's your favorite? Do you follow many sports, just a few sports, or only one? If not, what is it about sports that leaves you cold? Extra Credit: If your organization, your family or your friends had a mascot, who or what would it be? 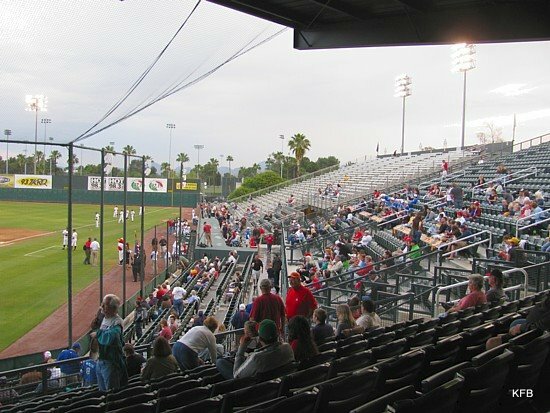 A week ago Thursday, John and I went to kind of a watershed sporting event in Tucson: the return of the Tucson Toros I've written about the Toros a number of times before, but here is the short version. 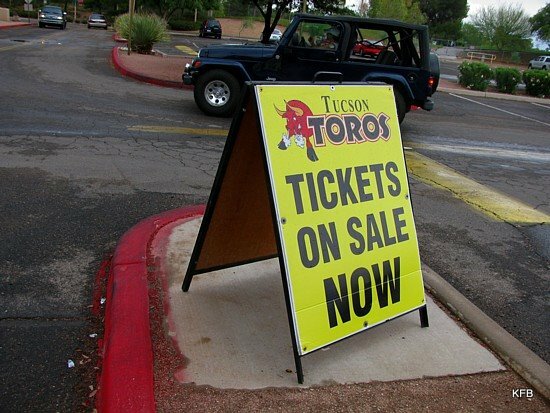 Having had a number of lesser teams sporadically over the decades, Tucson got a triple-A baseball team called the Tucson Toros in 1969. The guy who won the name the team contest, Clarence Dupnik, went on to become the sheriff of Pima County, which he still is. Anyway, the Toros won two championships in the early 1990s, but in the mid-1990s were sort of systematically dismantled. The team changed its owner, major league affiliation, team name, ballpark, general manager, radio announcer, team colors and mascot, all in a two year period. 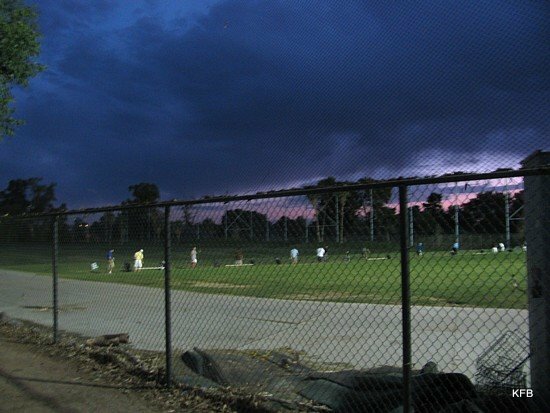 Fans abandoned the team in droves, and never really came back, even when the Tucson Sidewinders won another championship in 2007. 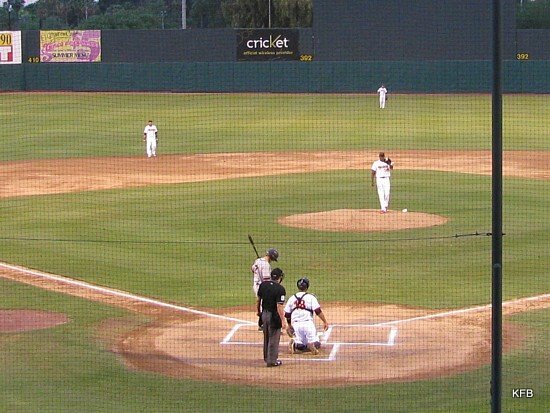 2009, and the Sidewinders have changed names again and split for Fresno. Who needs 'em? Former Sidewinders owner Jay Zucker has retained the Toros team name and brought them out of mothballs, this time as part of the independent Golden Baseball League. 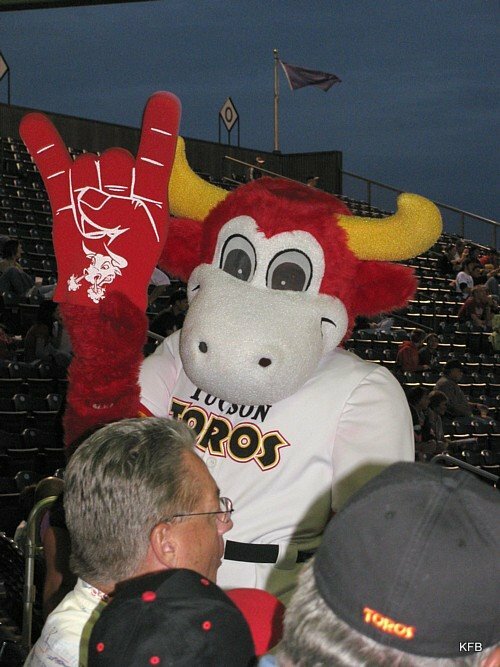 The Toros have basically the same logo as before, the same colors, the same ballpark, and good old Tuffy the Toro as mascot. If you ever wondered about the origin of my old dog Tuffy's name, now you know. 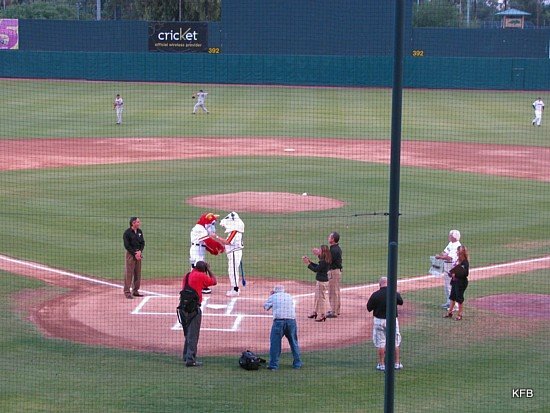 The Toros' original mascot greets the current Tuffy. The reconstituted Toros' home opener was scheduled for Thursday the 21st. 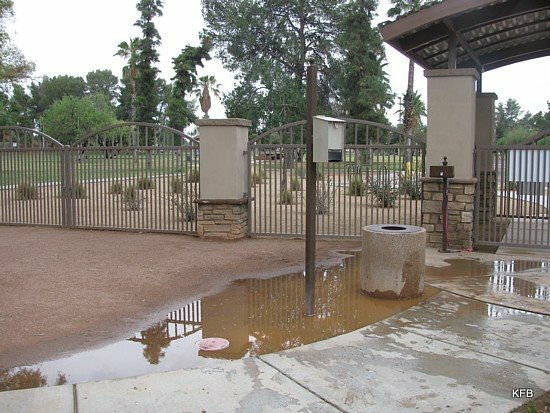 That was the same day that the skies over Tucson opened with a record amount of rainfall for the date. Uh-oh! But the rain eased off in the afternoon, and the game was on! 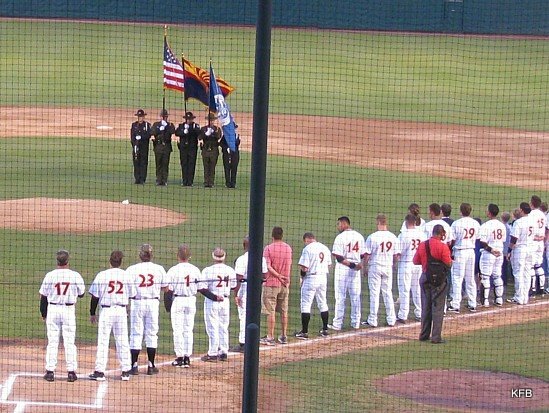 Baseball is nothing if not traditional, which probably helps to explain why Tucsonans feel so strongly about Toros team history, what the team should be called and where it should play. Beyond that local stuff, there are all sorts of rituals baseball observes, on and off the field, all across the country. First the visiting team is announced, coaches, bench players and starting lineup, and come out to stand between third base and home. Then the home team's coaches and players are individually announced, and line up between home and first base. 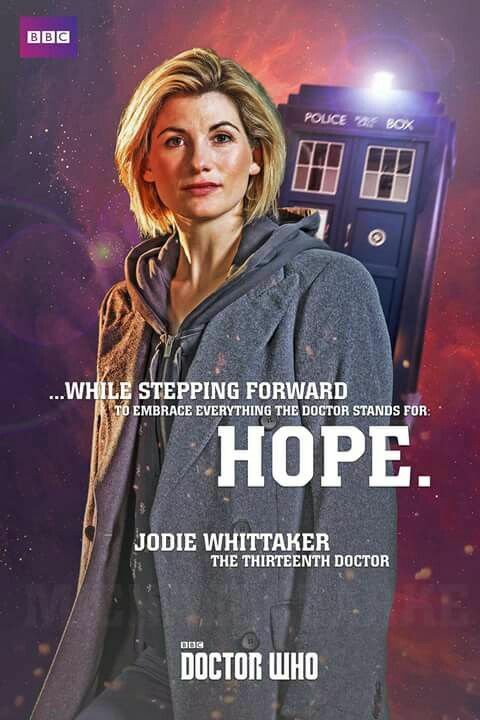 (I suppose in some venues they might line up elsewhere.) A military color guard comes out, and we have the national anthem. There is a ceremonial first pitch, the umpires congregate for a last minute chat, and then, PLAY BALL! Once the same begins, it's all about balls and strikes, fair and foul, outs and hits and errors. Even children can follow what's happening, and soon learn the beauty of the game reduced to numbers. But it's more than that. It's a handshake or an autograph from the team mascot. It's hot dogs and beer (or soda). It's free T-shirts shot from a launcher. It's the dizzy bat race, and Take Me Out to the Ball Game, and autographs after the game. And it's also best of your team actually wins the game. 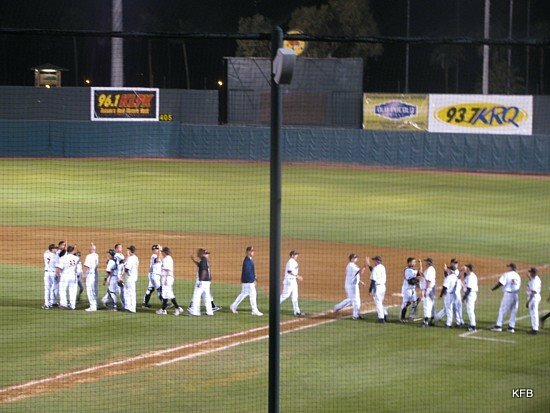 The Toros won their first game, behind a rather good starting pitcher, thanks to a couple of really good hitters, and no thanks at all to several relief pitchers who gave up lots of runs. One pitcher has since been released. And I love it. There was a time when John and I used to go to every Toros home game. I sat there and scored each game in a score book, and passed notes up to the radio booth. Then the Toros went away, and with it my baseball mania. I'll probably never be as into it as I once was, but I really, really enjoyed Thursday's game. Now understand: I was never a sports fan. As a kid I was vaguely aware of a few players' names: Mantle and Mays, and Syracuse University football stars Little and Tittle, Brown and Czonka. But I didn't go to games, I was terrible in gym, and hadn't the slightest interest in any of it, except, maybe, maybe, about 1% interest in baseball. Heh! 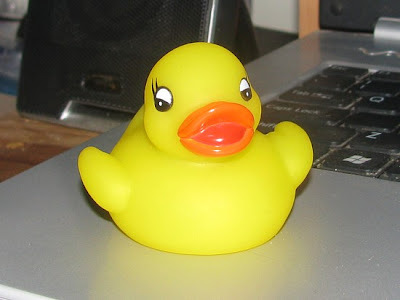 Oh, and my mascot? Who else but a certain dog? And I don't mean Tuffy. 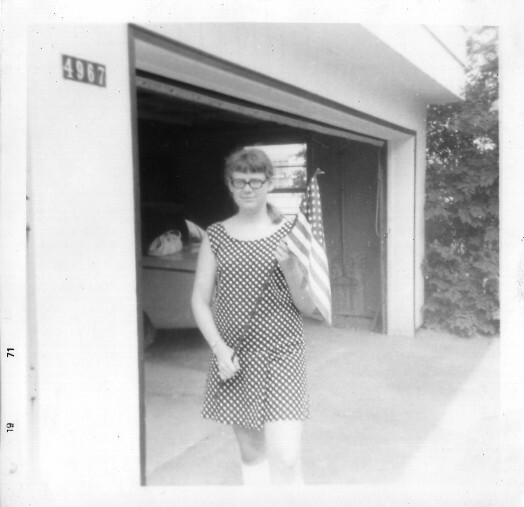 I grew up in the Girl Scouts, so we marched in several Fourth of July parades when I was a kid. As an adult, I was in a couple of parades. Back in the late 1980s The Texas Broadcast Museum got to bring up the rear of the Cotton Bowl Parade. We had a 1948-vintage television remote truck, which was really a bus that had been gutted and made over for the purpose. The truck had a large platform on top. Paul drove the truck, and a couple of us climbed up on the platform. One had a camera, and I had a microphone. It was a lot of fun, but we froze various bits of our anatomy off. It had actually snowed a bit overnight, and it was darned cold. When I was younger we used to go to the Fourth of July parade up the street from our house. I think the only reason I went was for the candy that they would toss out. Oh, and one year my friend's little brother was in it. He was in some drum and bugle corps thing. I never really got a big thrill out of them though. I'm not sure why. I'm still dangerously low on "guest professor" suggestions for these Weekend Assignments, so I ask again: please, please, please, PLEASE PLEASE PLEASE PLEASE PLEASE email me some new ones. I warn you, I will continue adding another please to the previous sentence each week until someone suggests something. Save us from the invasion of the pleases! I had been up most of the night doing CPAexcel units on the subject of bankruptcy law, a somewhat depressing subject even if you have a good job and manageable debts. Obviously, I'm still working on the "good job" part. The units were due at midnight, but the computer-based grading system doesn't really care if you complete the assignment a little late. Just click a button that says "regrade" and all is copacetic. Even so, I didn't want to fall even further behind. I wanted to finish the entire section, but around 5 AM excessive sleepiness put an end ot that plan. It would have been nice to sleep in a bit, but I awoke just after 10 AM and got up. I have an interview Thirsday morning for a part time bookkeeper/ accountant job at St. Michael's, for pay this time; and I needed to turn in the job application today. It was a PDF file, which I filled in by hand yesterday. My handwriting can at best be referred to as "somewhat readable," so John and I between us spent a few hours over the last day and a half trying to find a way to add my answers to the file as printed text. Saving each page as a jpg wasn't the most practical approach (or maybe it was), so John opened it in real Acrobat and tried to make it a fillable form. That would have been ideal, had it worked; but it didn't. When I went to download the emailed edit of the file, I came across an ominous-looking email from the state unemployment service, something about my unemployment claim for last week. Uh-oh! Now what? When I tried to open the email, nothing happened. That's when the internet connection went down, completely and convincingly. I spent the next hour booting John's computer, checking the modem, the router and various cables, and then playing with the job application file to see if I could find a way to add my data. No luck with any of it. I could add little comment boxes with red text, but that would do me no good. Deprived of the internet, short of sleep, stymied by a program I should have been able to conquer, and even without a manila envelope in which to put the form as requested, I was not a happy camper. The unread email from the state almost certainly meant bad news, and I was annoyed that I'd have to turn in a messy, handwritten job application, undercutting my reputation at St. Michael's as a computer whiz. My pending job interview was starting to stress me out a little. Can you see? He's got flashing red lights inside! I've named him Fester. 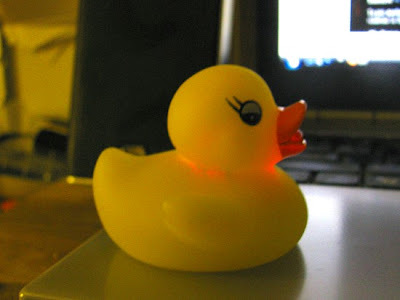 My brief visit to Plunkett's, with the friendly staff, the inexpensive envelope and the unexpected whimsy of a light-up rubber duck, marked the exact moment my day turned around completely. I dropped off my application in the right kind of envelope, and realized that nobody else cared that my info was handwritten. Furthermore, a St. Michael's volunteer told me that her Cox internet connection had also been down that morning, but had since come back up. I could stop worrying about equipment failure at my end of things, or prolonged internet deprivation. When I got home, I opened the email from the state, and it was no big deal. Suddenly, after all these months, some human, computer or combination thereof has decided that it's a good idea to remind people to file their claim for the previous week if they don't jump on the task by 6 PM Monday, and warn them they'll be dropped unless they file by Friday. I filed on Tuesday and the system knows it. Everything is fine. This afternoon I was at church again, doing the volunteer stuff, and early this evening the dogs and I went to the dog park as usual. I have to admit that after eight months, I'm getting a little bored with the place, and even the dogs are not enjoying the dog park itself as much as they used to. 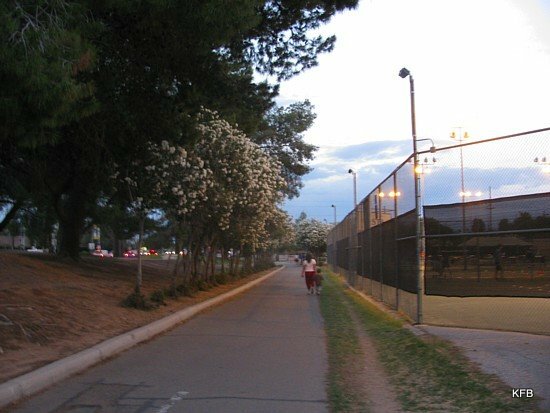 I took them around other areas of Reid Park, getting some exercise, amusing the dogs with interesting smells, and trying to prove to Pepper that the ferret she smelled at the concert was long gone. She should not expect to find ferrets in Reid Park. Yeah, sure - except tonight there was a couple near the performance center with a ferret on a leash! Fortunately I didn't let the dogs close enough to even know it was there. Ferrets! 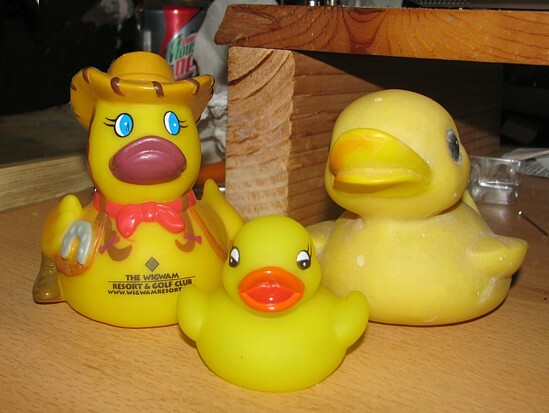 All in all, I prefer ducks. And so, of course, does Cayenne. For Ellipsis Monday Photo Shoot #39: Memorial Day, my first thought was simply to visit my mom's cemetery, something I hadn't done in ages. I did go there eventually, but first I made a few other stops. Let's start here, at the corner of 22nd St. and Kolb Rd. in Tucson, AZ. 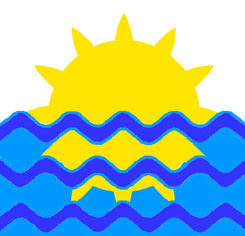 Carly asked for a picture of a flag, preferably with a frame around it. This shot I framed and then added a stars cutout effect. Now this is a huge, huge flag, probably one of the biggest in all of Tucson. 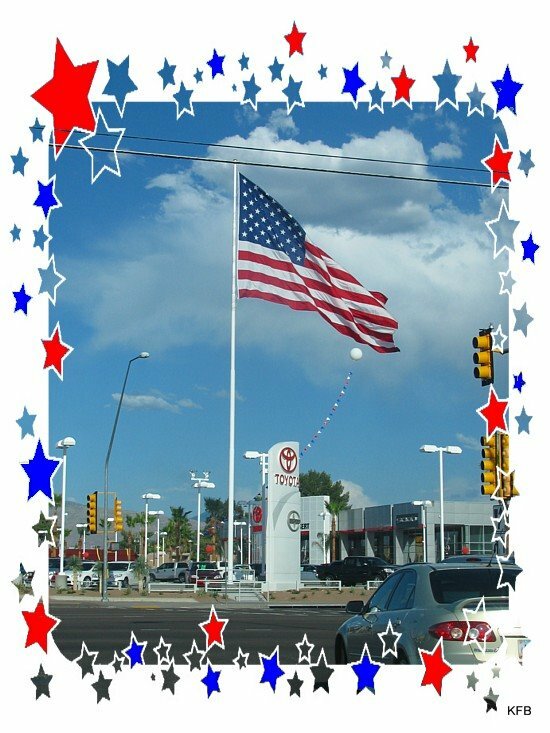 It amuses me greatly that this display of ostentatious patriotism is at a Toyota dealership. I guess in this case, love of country does not equate with the sentiment, "Buy American!" Then again, there's probably at least one Toyota factory in the U.S. these days. But isn't all this kind of emblematic of this country? It's big and brash, heterogeneous and inconsistent, but all the better for trying to be too many things at once. I was actually at 22nd and Kolb to buy a couple cheap McDonald's cheeseburgers for myself and the dogs. The flag was a happy accident, although in truth there are a lot of car dealerships in town that display large flags. Anyway, from there I headed south on Kolb to the Boneyard. 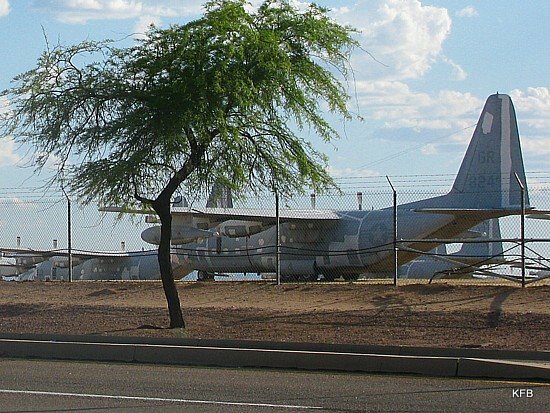 This is the nickname of the local aircraft graveyard, formally called the Aerospace Maintenance And Regeneration Center, or AMARC. I've photographed bits of the Boneyard a number of times before, but it's a huge place that goes on for miles and miles, and rewards repeat visits. 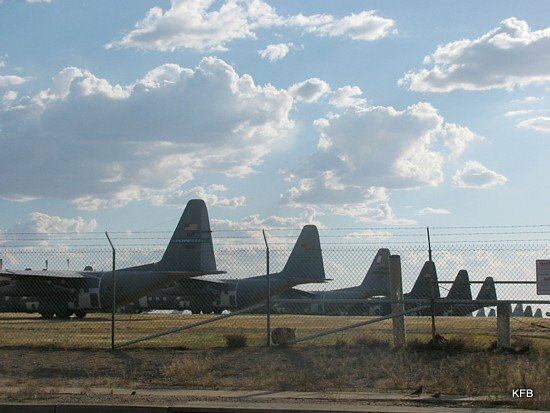 For a while, years ago, hundreds of recently-retired B-52 bombers lined the road, each one essentially a killing machine, mostly used in Vietnam. I'm not going to argue the merits of wars in general or that war in particular. It just makes me sad, that's all, to think of all the people killed, on all sides of every war. I'm not deriding the morality or bravery of anyone; I just wish nobody had to die over religious, political, territorial or economic conflicts, anywhere in the world. One thing I especially admire about today's military is a nation-building aspect of what they try to do. Unfortunately, even that can be a terminal occupation. 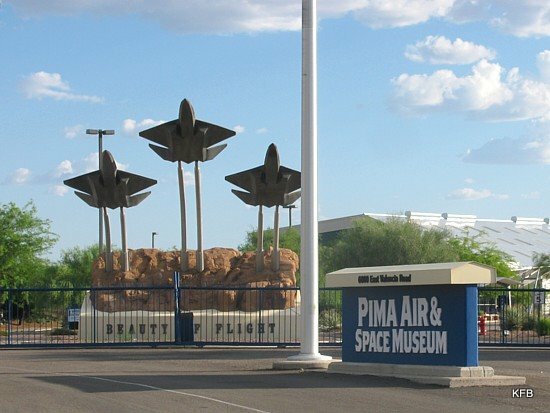 Near AMARC is the Pima Air & Space Museum, which features a whole barracks building devoted to a particular WW II squadron. I've been through the museum's indoor and outdoor exhibits three or four times over the years, but mostly I end up swinging by when they're already closed for the day. 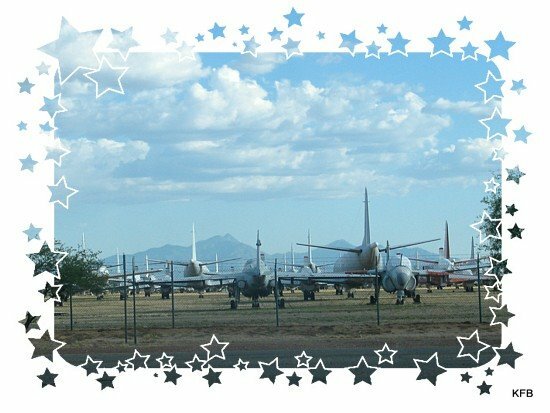 Years ago, it used to be possible to pull into the parking lot and take pictures through fences of some interesting aircraft on the museum's periphery. But now it's fenced off when the place closes at 5 PM. Still, I wanted to make another attempt at a good picture of the "Beauty of Flight" monument at the parking lot entrance. You may be relieved to learn that I didn't take a single photo at Reid Park today. Neither the dogs nor I felt like hanging out there for long, although we did go briefly. 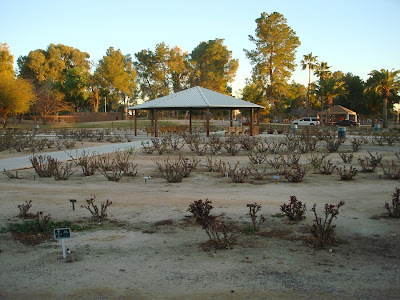 From there we headed north and east to East Lawn Palms cemetery, where my mom is buried. The dogs, of course, had no clue what the place was, but they knew it wasn't a dog playground, and behaved tolerably well. The entrance drive was lined with flags, as I knew it would be. 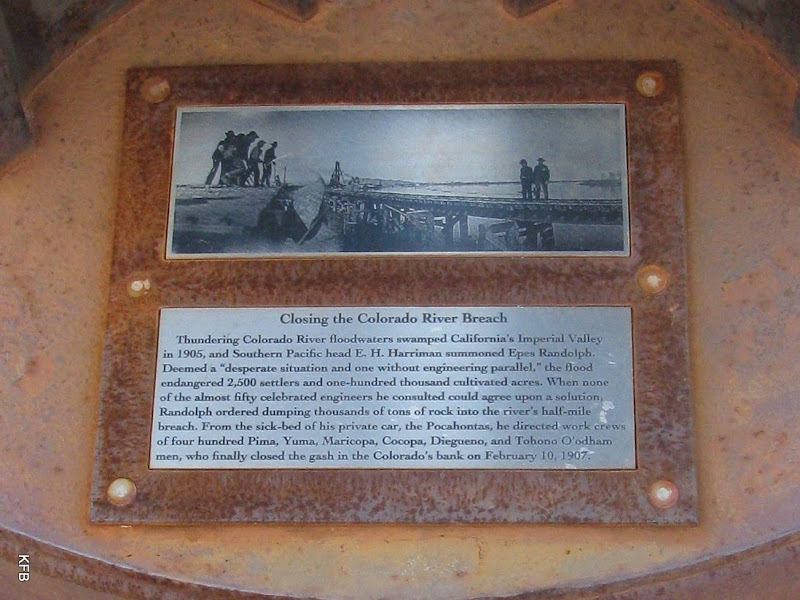 I was there on another Memorial Day years ago, and took pictures then too. The difference is that on that occasion I was there earlier in the day, and an employee gave me a free flag for my mom's grave as I drove past. My mom was not a veteran, but her mother was. My dad is a World War II vet, but he's alive and well, thank you. I did make a courtesy visit to my mom's grave, and momentarily felt like crying when I realized I was singing a song my mom wrote, which I quoted from on her grave marker. 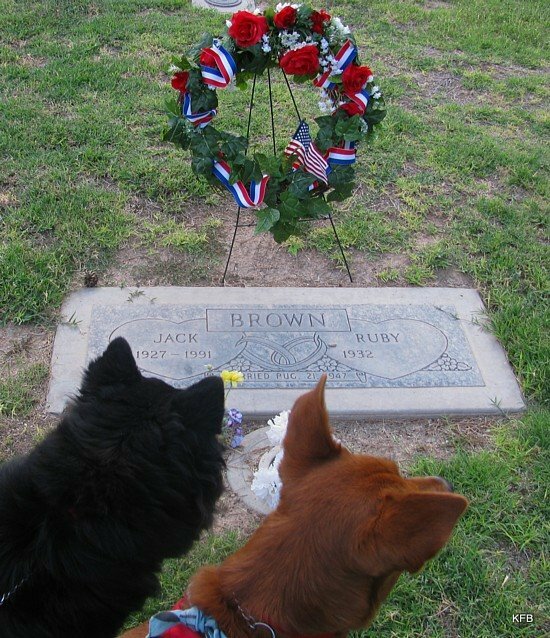 But mostly I was looking at Memorial Day remembrances: flags, red white and blue flowers and so on. I have a bunch more photos of the Boneyard and the cemetery, and things to say about some photos that I won't be posting in this blog entry. Let's not overload this blog with image files, for once. If you click on any picture above, it will take you to a Picasa album of the day's shoot, with captions on a number of the photos. I especially like the one of two graves marked by flags and a teddy bear. And now, having been at work on the photo editing and this blog entry for nearly 6 hours straight, I'm going to post this and go to bed. Catch you later! The dogs are up for a drive to just about anywhere, rain or no rain. Ack! I didn't post an entry yesterday, and now today's almost over as well! I have been taking a lot of pictures, though. Let's put a dent in the backlog! These are from Thursday, when it rained all day here, more than double the total rain that usually falls in the entire month of May. 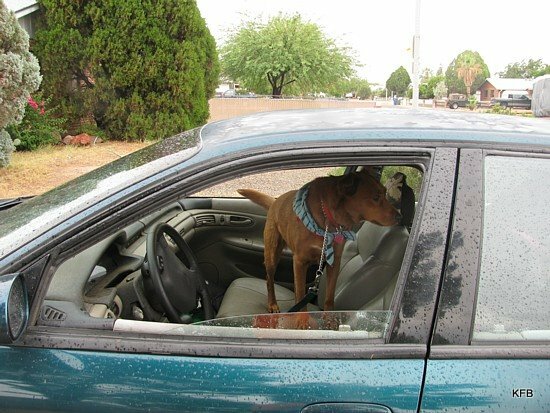 I took the dogs with me on a joy ride around town, checking for flooding. Results were mixed. 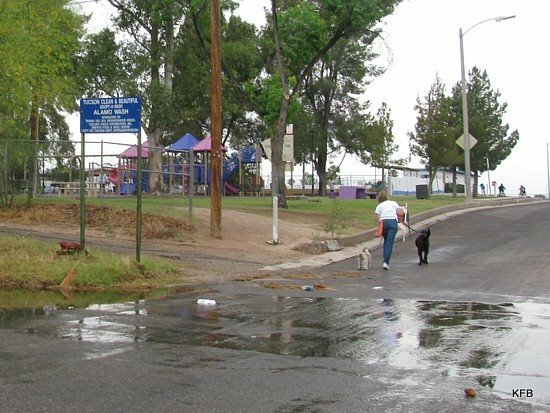 The nearest arroyo (wash) to Calle Mumble is the Alamo Wash, which crosses Calle Betelgeux next to the high school athletic field behind 22nd and Kolb. As I approach, it just looks like a few inches of water crossing a dip in the road. And on Thursday, the water really wasn't all that deep on the road itself. But look to the right as you drive slowly through the water, heading east. There's a pretty little green river, brought into existence by a floodplain and a few days or rain. 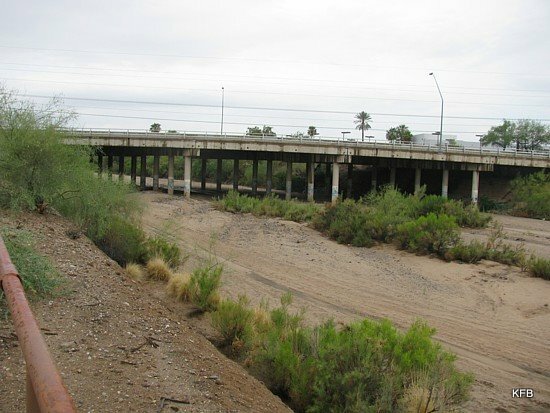 Trees grow along the arroyo, taking advantage of seasonal and unseasonal rain, and sending down a taproot into the aquifer below. 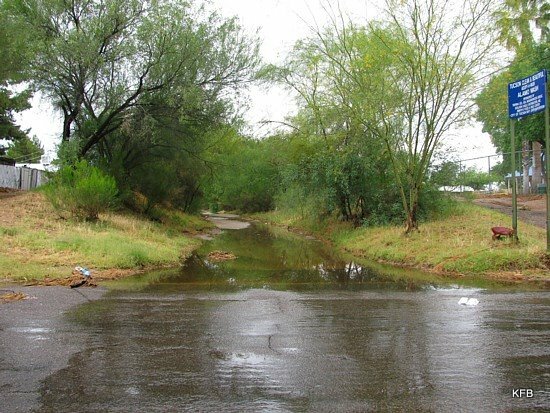 The result is a riparian habitat, which supports a very different set of plants and animals than one finds in the surrounding desert. 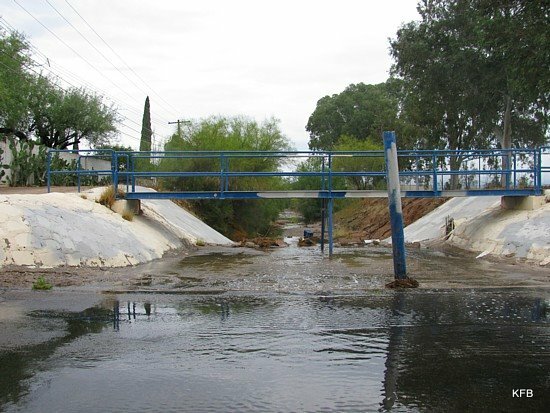 Keeping these areas from being destroyed by overpumping groundwater or constraining the water flow too much is an ongoing challenge, especially since the occasional flood can be very destructive to surrounding property. But this particular stretch of the Alamo Wash is pretty and peaceful, at least on the south side of Betelgeux. 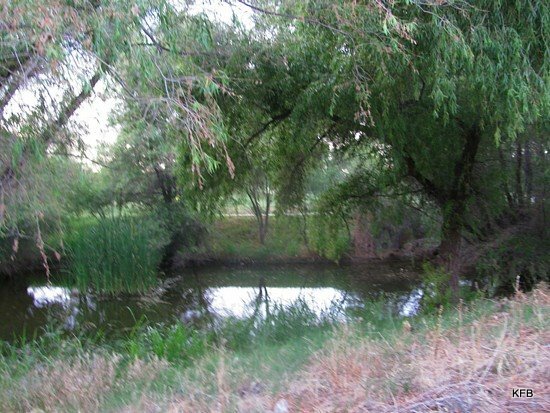 From there we went to the Pantano River, also called Pantano Wash. Here the damage is done from the lowered water table. 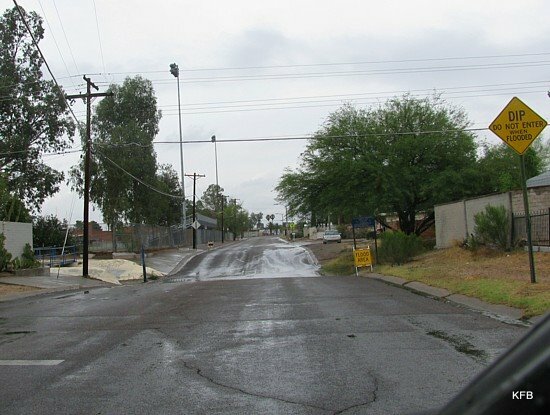 Water flows sometimes, but even the significant rainfall of Thursday and the days preceding it was insufficient to bring much more than a strip of dampness to the stretch of the river near 22nd St at Pantano Parkway. After that we turned around and went in the other direction, all the way to the dog park. There was definitely flooding there. The dogs took it in stride, and Pepper in particular ended up with muddy paws. 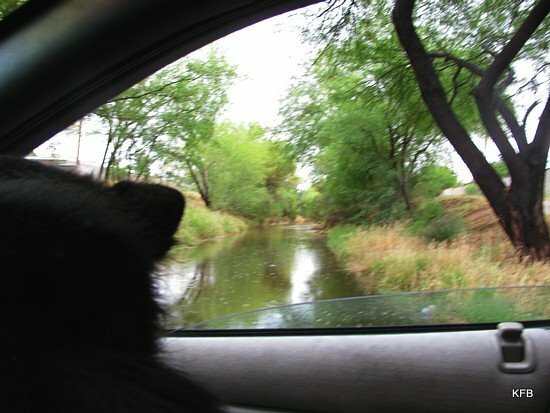 When we left the dog park, I decided to go back to Alamo Wash for more pictures. This is the view looking north as one crosses the water, going east on Betelgeux. This is where shopping carts, recycle bins and other detritus sometimes wash up. It's also where kids occasionally hang out, on or under the little bridge. Neighborhood flooding isn't confined to that one little strip of road. Here's some more, a block or two away. 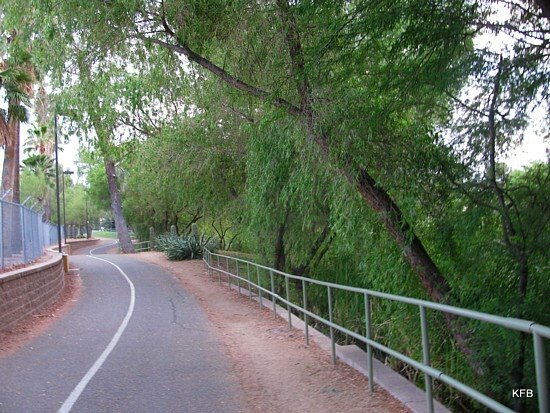 A different stretch of Alamo Wash runs past the neighborhood park. 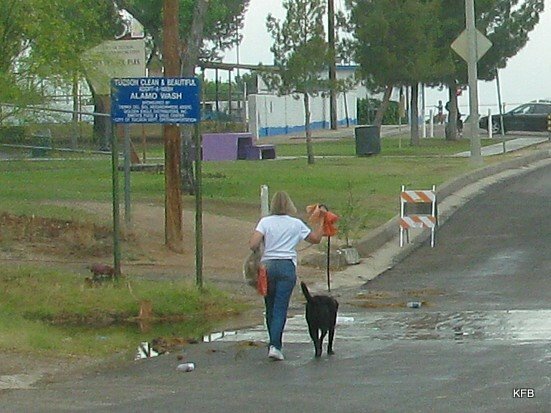 The woman in the photo above is carrying the smaller of her two dogs past the stretch of flowing water. Safely past the wash, the terrier resumes its walk. And here is the stretch of Alamo Wash immediately south of where the terrier was carried. Tucson Clean and Beautiful is looking for someone to adopt each of these stretches of Alamo Wash, but I think overall they're in pretty good shape. At least, they were on Thursday! Late again! I had a topic all planned out, but a Tucson Toros game, lots of photos to edit and excessive sleepiness delayed its implementation. Much later, I remembered that this is Memorial Day weekend, and that I have this week's assignment, minus last week's responses, saved to draft. Here it is. Weekend Assignment #267: In some communities, Memorial Day is celebrated in part by a local parade. Have you ever appeared in a parade, or at least attended one? Details, please! Note that I'm asking about any parade, not just a Memorial Day one. I grew up in a house on Fayetteville-Manlius road, about a mile outside the Village of Manlius, NY, roughly two miles from the Village of Fayetteville in the other direction. Both villages were in the Town of Manlius. Fayetteville and Manlius both had annual Memorial Day parades, and at one time or another I was in both of them. The main parade for me was the Manlius one. I'm sure I marched in it as a Junior Girl Scout. Many years later I was in it again, carrying a non-functioning rifle in front of the high school band. I had a baton, but never really learned to twirl it very well. I just don't have the dexterity for something like that. Nor did I ever get good enough on the clarinet back in fifth grade to join the school band. Getting braces on my teeth was my ticket to dropping clarinet lessons, which I accepted gratefully. Anyway, my task was simply to march in time, which was challenging enough for me. The highlight was always at the corner of Fayette Street and Seneca, where one could usually see an exposed cobblestone or two and a bit of the old trolley track from the turn of the 20th Century, when a streetcar carried people from Syracuse all the way to Suburban Park. Even if I wasn't in the Memorial Day Parade in Manlius, I always attended it. If my family didn't drive, I'd probably walk into the village, and stand somewhere near the former elementary school, Temple's Dairy Store and Sno Top. Temple's would sell pinwheels, vendors sold little flags, and Sno Top would sell twist cones dipped in chocolate on its "humdinger" opening weekend. Besides the scouts and the school bands, the parade itself always featured a vintage carload or two of World War I vets, marching World War II vets in the VFW (my dad, a former POW, was never part of such things), and the volunteer fire department, including my seventh grade social studies teacher, Thomas Murphy Hennigan. It wasn't the most exciting parade in the world, but it was a community event, something that drew us all together for an hour or so. One year - and only one year - my mom took me to a Thanksgiving Parade in downtown Syracuse. I think kids' host Denny Sullivan was associated with it in some fashion, and I know I got one of those balloons with a shaped balloon (Mickey Mouse?) inside a clear round one. That's all I remember about it. 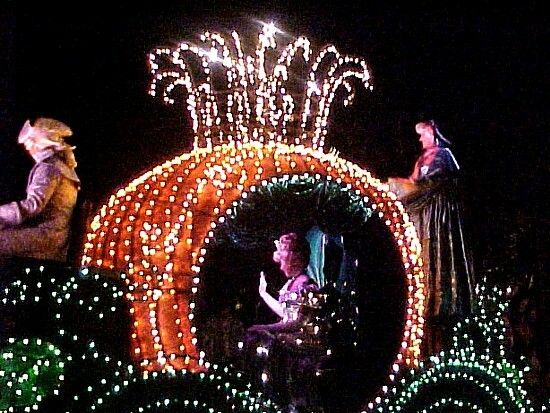 Disney's Electrical Parade at California Adventure, July 3, 2003. I never got to the Columbus Day Parade in Syracuse, the Martin Luther King Day Parade in Tucson, or any parade at all in Columbus or Florida. My post-Manlius parades have all been at the Disney parks - Disneyland, California Adventure and Walt Disney World. And I like them very much, yes I do! The 1970s era was sharply divided between high school and college. I've blocked out a lot of my high school years, though I still keep up with a few good folks from that era. College was much better, especially after I switched majors. My counselor at high school pretty much forced me into a business major in hopes that I'd find a nice fellow business major who would take care of me and lead me to a life of bland suburban bliss. I had other plans, and switched my major the first week of school. After doing a little math, I figured out I was in 4th grade 30 years ago. It wasn't my best year in school. Not that I remember a whole lot, I just know that I got screwed with my teacher. My brother is three years older than me, and when he was in fourth grade he loved his teacher. I guess she was really nice and helpful. So I was looking forward to it over the summer. Then the bad news came. That teacher left, but that wasn't the worst part. The replacement was my old nemesis from kindergarten. 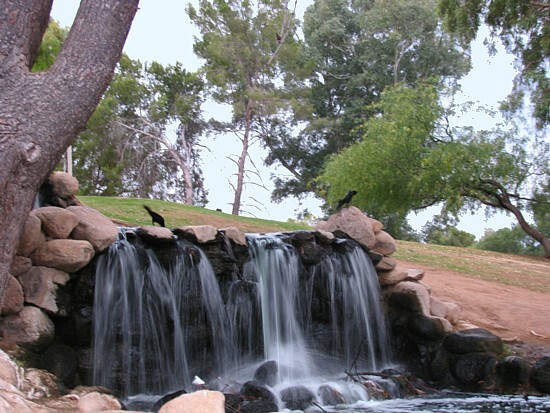 Grackles at one of the Reid Park waterfalls. 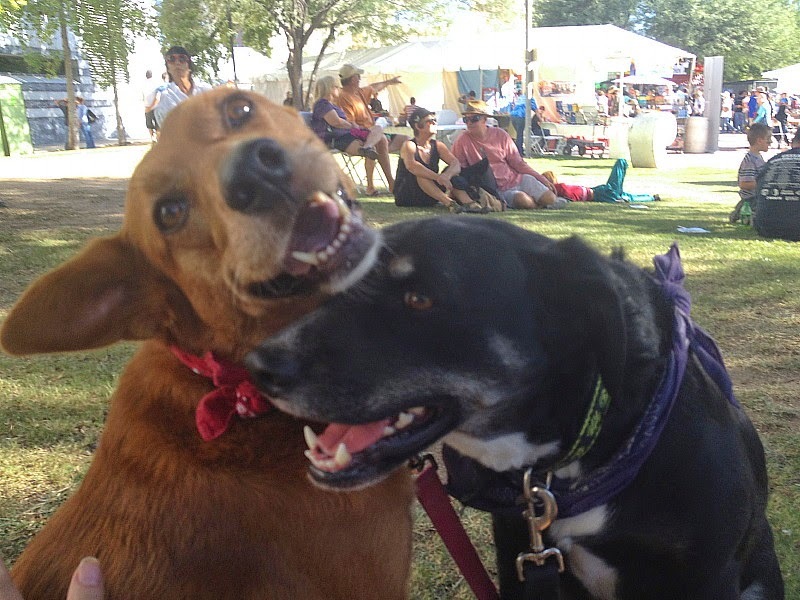 In recent days, Cayenne and Pepper have made it very clear that their beloved dog park is only part of what they want and expect from our daily outings together. Sometimes they head for the exit gate of Miko's Corner Playground after only 15 minutes or so, only to lead me away from the car, gallivanting across Reid Park as we've done so many times recently. Even on a leash, they seem to enjoy the chance to cross fields and sniff at trees and running water, encounter more humans and dogs, and be happily frustrated that I won't let them chase the ducks again. The most interesting concert-goer, according to Pepper, had four legs. 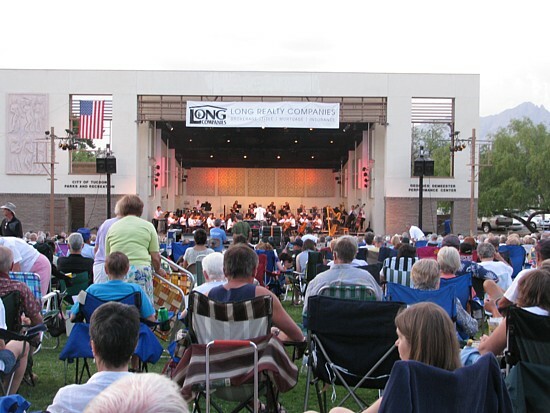 Sunday evening, for example, the Tucson Pops had another concert in the park. I took the dogs to the back of the performance center long enough to hear their first selection, Peachtree Promenade, which I liked very much. Next to us, and elderly couple had their folding chairs and a blanket, and a ferret in a box. Pepper was extremely interested in the ferret, much to the amusement of the man, who held the ferret up in the air briefly for the dogs and me to see. When we left, Pepper didn't want to go. At the end of the five minute walk back to the car, Pepper tugged at the leash to go back to the dog park. I took them in and removed their leashes, and Pepper immediately headed for the opposite gate - the one that led back toward the ferret! The open door has a lighting feature I didn't notice on a daylight visit. But they mostly seem content to go where I want to go. 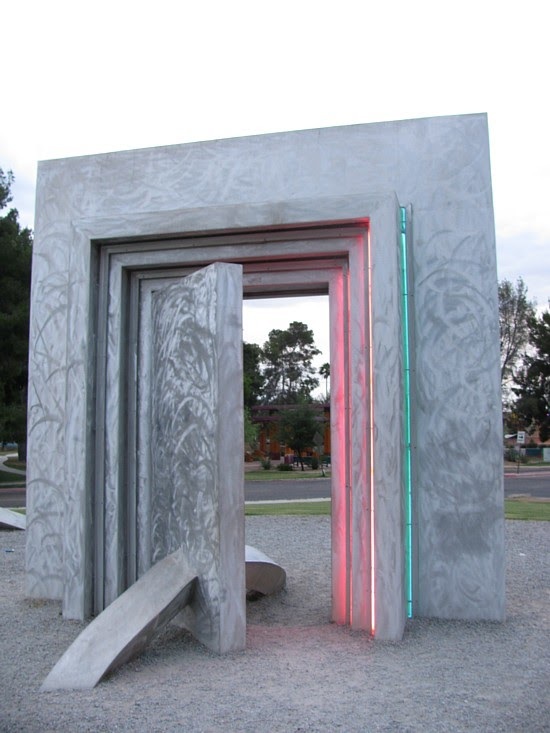 I wanted another look at this sculpture, which I call Open Door. It has no identifying plaque, and is not mentioned online anywhere I've found other than this blog. Early in the week I noticed as I drove by at dusk that it has neon lights that come on at night. I didn't notice these the first time I photographed it. But when I went to take another look this week, I was sidetracked and missed the sculpture at first, and had to circle back around. The source of my distraction was a couple of young women who were allowing their dog to splash around in the feeder streams and ponds that lead to the southern duck pond. I warned them not to let their dog into the lake itself, because, as I discovered with Cayenne last week, it's full of smelly muck. "Oh, this is, too," the young woman with the leash said. "I just give her a bath afterward." Uh, okay. 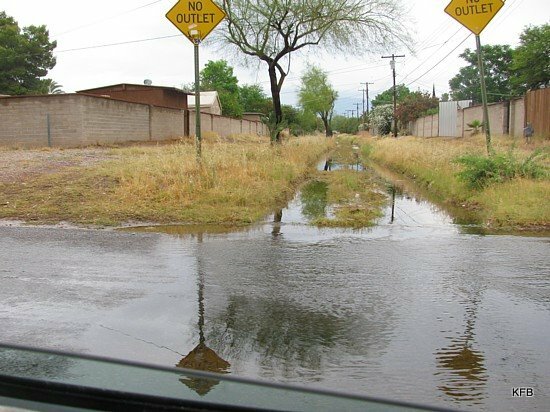 It's been raining all week here, which is unusual for Tucson in May. Thursday set two new records for the date, one for the lowest high temperature (68 degrees), one for the most rain (0.53 inch, which is more than double the average for the entire month of May). I have lots of pictures from Thursday afternoon, when I took the dogs gallivanting in the intermittent rain, and drove to places most likely to be flooded. But let's save those shots for the entry after next. Before that, I owe you a Weekend Assignment entry, but I've got to get some more sleep first. Yesterday I posted the results of my first, somewhat unsuccessful stab at an entry for Ellipsis Monday Photo Shoot #38: Night Shots!. 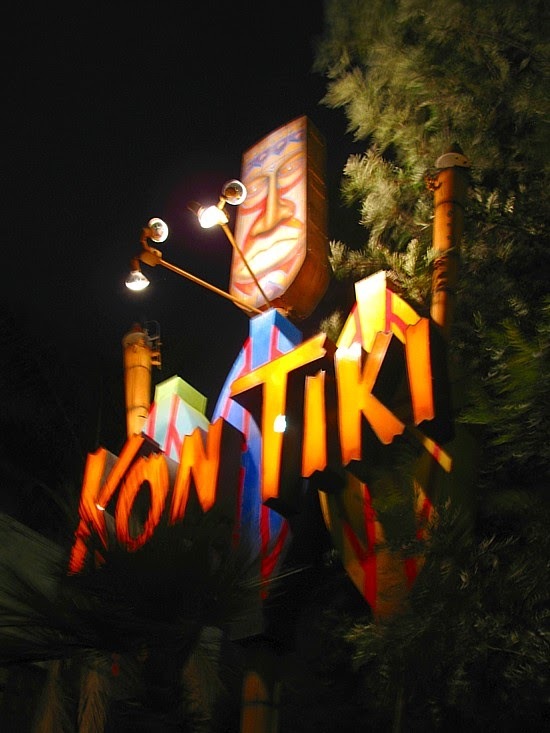 Last night, for John's and my 30th Anniversary, we were back at the Kon Tiki restaurant, one of my favorite places for night shots. 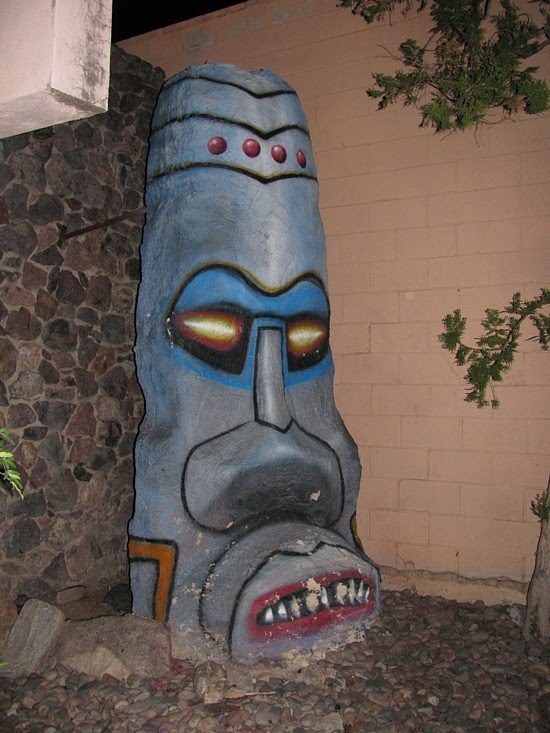 After dinner (Manuu with chicken for John, Hawaiian ribs and coconut shrimp for me), I took a handful of shots of a concrete Tiki head and other likely photographic targets. Let's take a look! 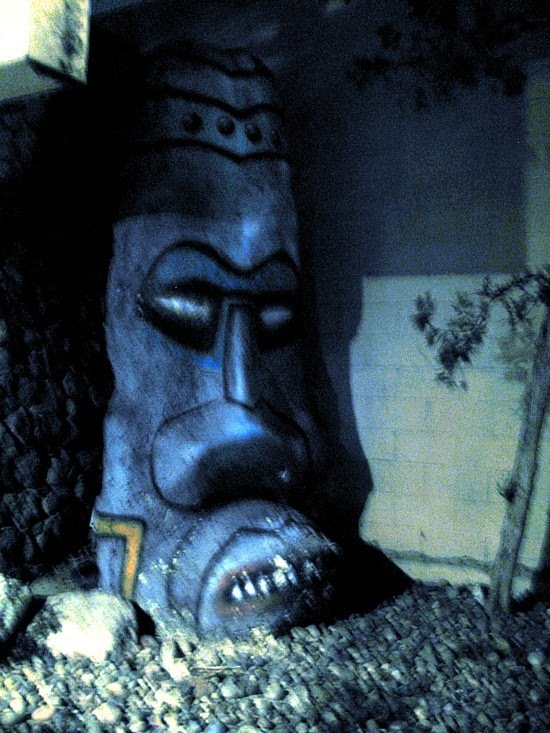 This guy, to the right of the entrance, inevitably needs a touch-up. This flash shot shows that, but also its rather striking design and coloring. The first time I photographed it, the colors and markings were completely different, and not nearly as good. On automatic, with the flash turned off, the camera delivers a picture that's almost completely black, much darker than what appears in the viewfinder before the button is pressed. When I autoenhance with PhotoStudio, the result is kind of interesting and spooky. This is the same shot, with a watercolor effect added. It ends up looking like a monochromatic version of paint by number. Turning the dial on my camera, I belatedly found a "night shot" setting. D'oh! It still needed lightening, but it's much better. I've also saturated the image a bit. 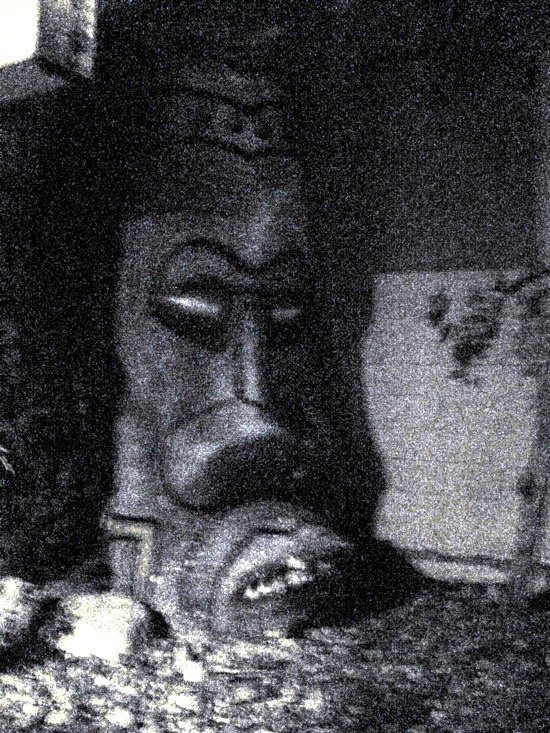 I've written about the Kon Tiki a number of times before. First opened about 1961, it's a wonder of midcentury tiki decor, refurbished a few years ago by someone who specializes in tiki bar goodness. It's mostly famous locally for cheap and lethal tropical drinks, but its national claim to fame is as one of the surviving examples of the early 1960s tiki craze. The food's good, too. If you're ever in Tucson, you should go. 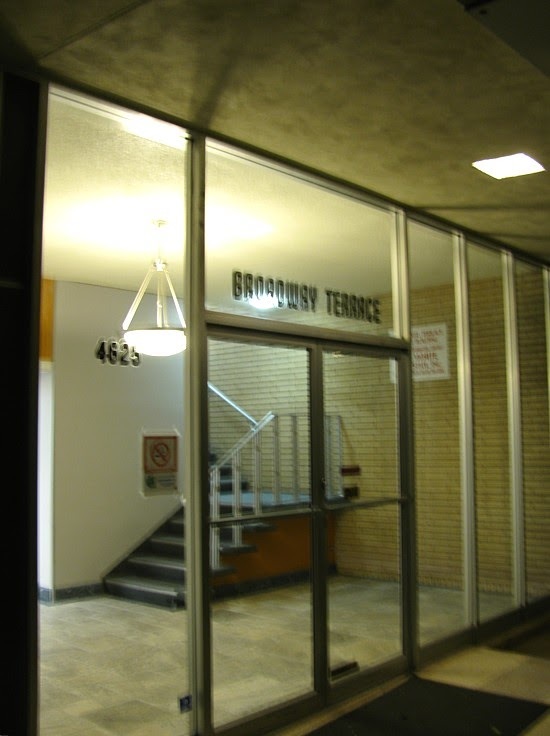 Anyway, it's in a midcentury modern shopping center and office building. This locked entrance to the offices is right near the Kon Tiki entrance. And here's the main sign, again with the night shot setting. I like how this came out. For Ellipsis Monday Photo Shoot #38: Night Shots!, I went outside last night, front yard and back, looking for something interesting to photograph. Normally I would have had the park or the drive home from the park to work with, but it started raining just before I intended to take the dogs over, so we didn't go. But the front yard didn't have much to offer. I was hoping to catch raindrops lit by the camera's flash, but the rain was gone and the puddles nearly dry. The raindrops on the car had turned to raindrop-shaped splotches of mud. I took a flashlight outside with me, hoping to get an interesting effect using that for illumination. But it wasn't a halogen bulb, and the camera barely registered its existence. 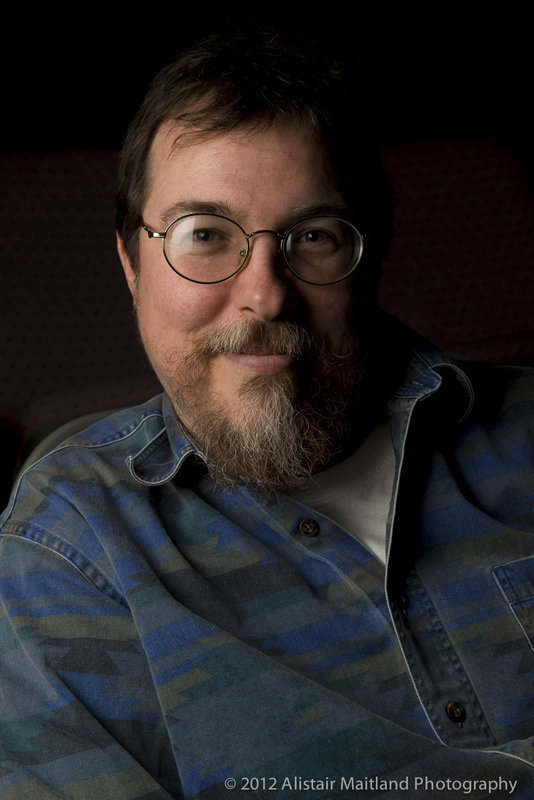 ...and then went for a flashlight shot or three with the camera set for aperture priority. That might have worked, had I been photographing stationary objects, but I photographed the dogs, who were wandering around, eating grass and checking out the flower bed as usual. Still, I like this one of Cayenne by the fence. Indoors was a bit easier. 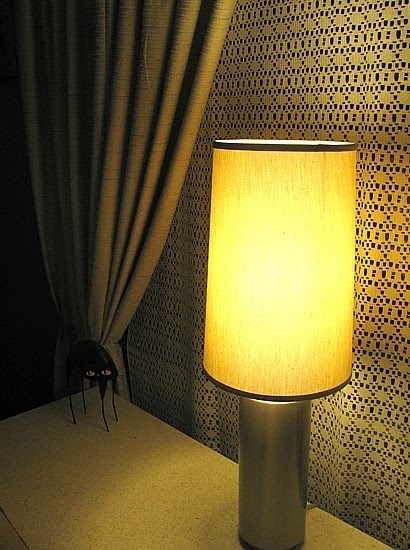 This lamp is in the front window. 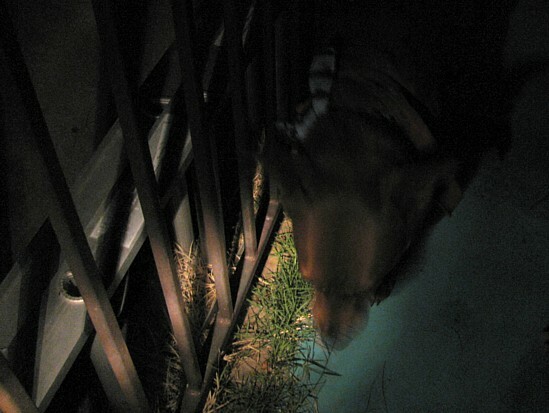 Since you ask, Carly, night photography mostly drives me crazy. If I used a tripod and really learned my camera settings, I might get a decent result without a serious SLR camera; but as it is my results are more misses than hits. Either I need to work harder at it, or accept that the vast majority of my night shots will be duds. Occasionally, though, I like what I get, even if it isn't technically very good. 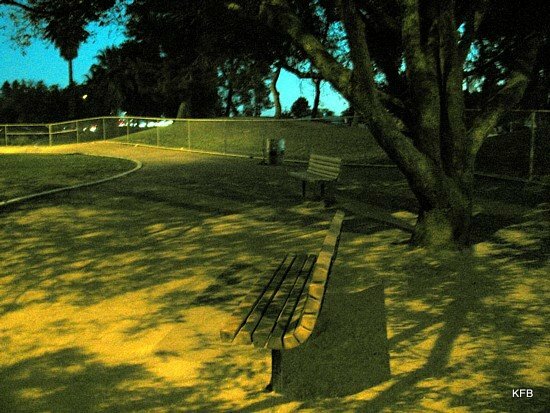 Here is a shot I did at dusk two weeks ago, lightened and adjusted. 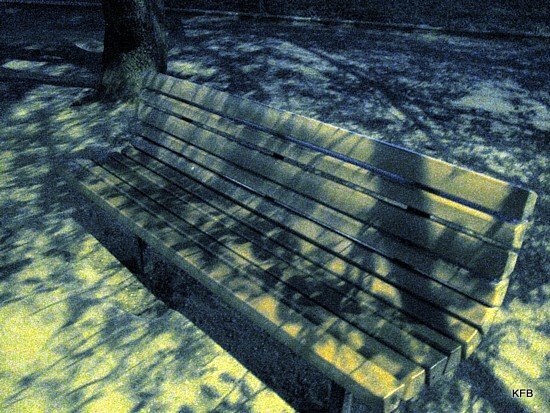 The idea was to bring out the pattern of shadows from the tree above the bench. I think it came out pretty well. Weekend Assignment #265: Darn Computer!